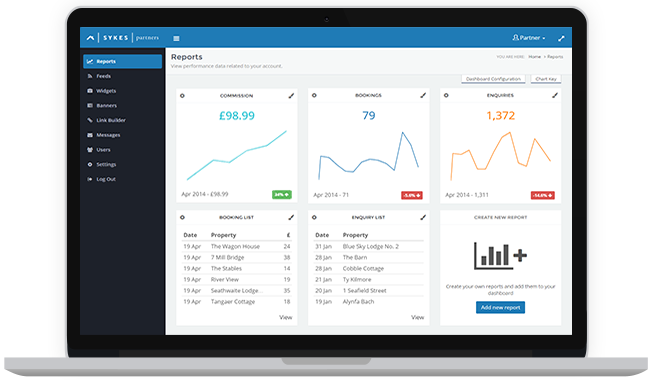 Check your performance stats, see what pages you're sending the most traffic to, customise your own reports and keep an eye on your commission. Take our feed and customise it to your own needs. Only take the information you want and edit the headers to quickly and easily fit your requirements. Take the effort out of building search functions. Quickly and easily build and customise search widgets that you can you use on your sites. Check your reports from home, the train or even the park. 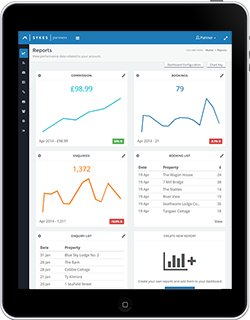 Whether you are checking from a desktop, tablet or iPhone our reports will be presented in an easy to view display. Work with the UK's Largest Independent Cottage Rental Company. We have more than 5,500 properties for you to promote to your users. Whether your site specializes in a region of the UK, is focused on pet friendly breaks, features only properties that have hot tubs or you passionately spend your time writing about family breaks then we've got properties that will suit your users and the easy to use tools to make them accessible. "Sykes has been by far the best accommodation booking agency we've had the pleasure of working with over the past 15 years(!) we've been online. Our account manager is extremely helpful, and what I really appreciate is how they keep improving, adding new features, and making it easier for us to generate bookings." "We have had a trusted partnership with Sykes Cottages for several years driving good levels of bookings between us. It’s great for us to be working in conjunction with a leading UK Cottage Brand who is as known for the quality of their product as we are." "We have had a good and productive working relationship with Sykes Cottages for a number of years now and always find them responsive and easy to deal with." "We are thrilled to say that we have collaborated with Sykes for over 7 years. Within that time we have seen their portfolio grow substantially establishing themselves as one of the UK's largest property managers. Their vast industry knowledge provides their customers with the confidence to not only book, but become loyal to the Sykes brand. This is continuously showcased with their high volumes of conversion on our sites. We are extremely excited to see what the future holds!"